CETEM is a non profit research and training centre born as an industry association in 1994 with the support of regional and national government, as well as the EU. It is located in the second biggest and most important furniture industrial region in Spain. 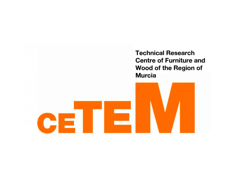 CETEM is entirely devoted to supporting and promoting the furniture and wood industries though research, innovation and training. As an association of companies has around 120 members (most of them SMEs), with a broad range of activities covering other sectores besides furniture and wood working.